Paneer, this Indian cheese have its own place in our weekly menu. Though this cheese is easily available in Indian stores, i love to prepare myself at home as making of paneer at home asks for easy breezy preparation. With full fat milk and lemon juice, you can quickly make this Ultimate Indian cheese at home. Earlier i usually get those store bought ones, but now i love to make my own dose of paneer at home. This cheese is very versatile and you can dish out many delectable dishes to succulent sweets. We love paneer in most of our foods, eventhough i have couple of dishes to give a try with this cheese. 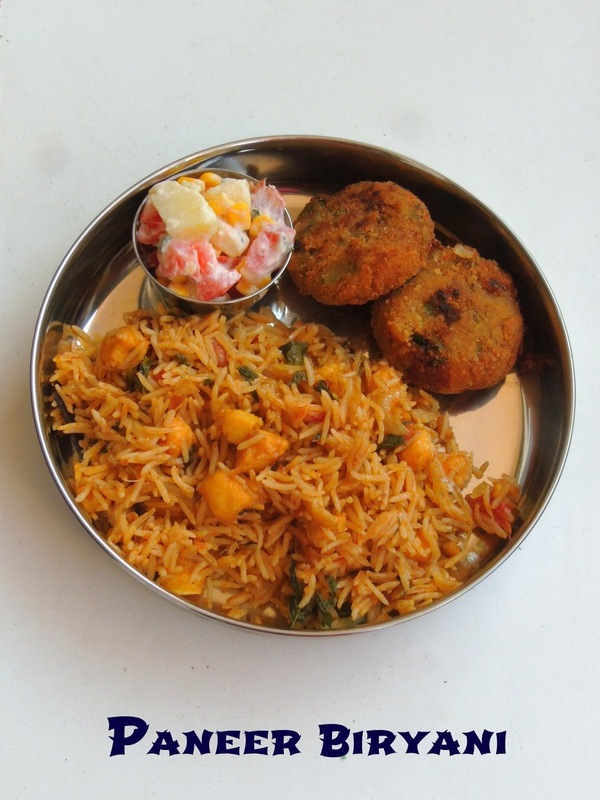 One among those dishes i seriously want to blog about is this Paneer biriyani. 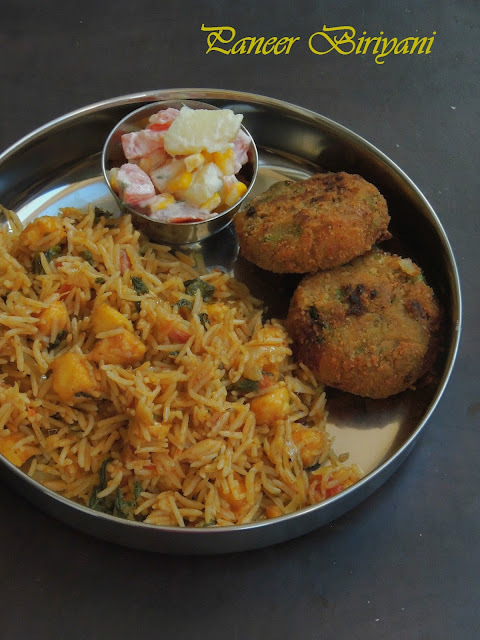 As i told earlier biryani is our most food and none will say no to this aromatic one pot meal. My today's paneer biriyani goes definitely for an easy version, with usual spices you can dish out this one pot meal quickly in pressure cooker. Cooking through pressure cooker makes our life easier, obviously if you are in hurry just go with pressure cooking. Am running this week's blogging marathon with Meal ideas as this week's theme, after a simple tomato biryani and a nutritious Mumbai style Rajma pav bhaji, my today's post suits absolutely prefect to this week's theme.Check out the Blogging Marathon page for the other Blogging Marathoners doing BM#61. Heat the oil and ghee together in a pressure cooker, fry the bayleaves, cloves,cinnamon stick and cardamom until they turns brown. Add immediately the sliced onions,chopped tomatoes, slit opened green chillies,ginger garlic paste and sauté with salt until the veggies get cooked and raw smell goes away. Meanwhile wash the rice and soak the rice with 3 cups of water,keep aside for 15minutes..
Add the cubed paneer,red chilly powder, turmeric powder,garam masala,cumin powder to the cooking veggies, cook for few minutes. Drain the soaked rice and add the rice soaked water,mint leaves to the cooker,bring everything to boil. Finally add the soaked rice,cook in high flame,close the cooker. Cook upto three whistles,put off the stove. Once the steam gets released, give a stir gently. Serve hot with onion raita..
Nice use of home made paneer here Priya! Mouth watering one Priya. Pls pass that plate to me. 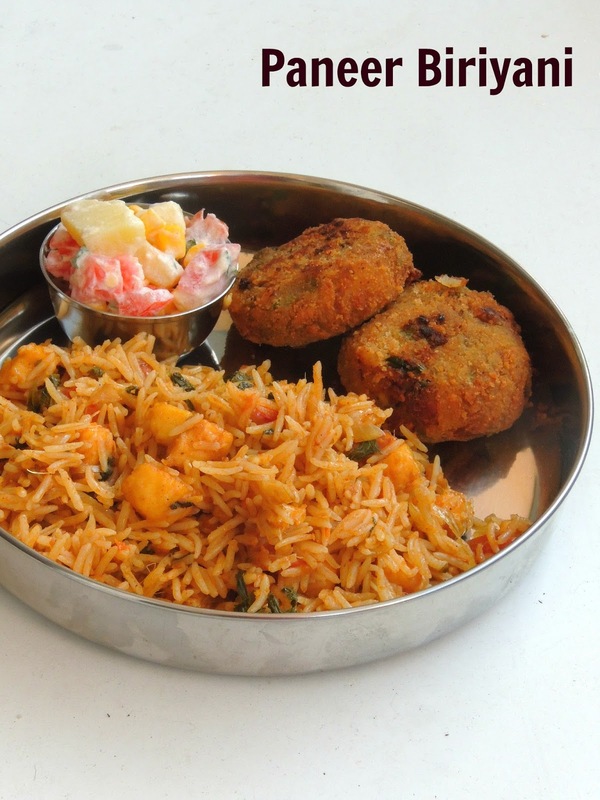 Such a delicious biryani Priya..the plate looks so yum! Simple yet delicious biryani. Love your food platter there. I love paneer and rice.Biryani looks delicious. Pressure cooker biryanis are the best -- quick and so convenient. Your paneer biryani looks soooo yummy.